What is an Arizona Promissory Note? Arizona Promissory Note: What Is It? An Arizona promissory note is a document that memorializes a loan made from one party to another. The parties are known as the lender and the borrower. Arizona promissory notes may be secured or unsecured. When a promissory note is secured, it means that the borrower promises that if they do not pay off the loan, that will give over some piece of property, known as collateral, to the lender to satisfy at least part of the loan. An unsecured promissory note documents a loan made where there is no collateral involved. If an Arizona promissory note is, indeed, secured, it must be titled as such. Because a promissory note is a contract, it is regulated by contract law as well as usury laws that control how much interest may be charged. Depending on what’s involved, a promissory note may also involve securities law. In the State of Arizona, the maximum amount of interest that may be charged for a promissory note is 10% per year. The date that the promissory note was created. List this by spelling out the month, listing the day, and then the four digit year. This will help avoid any confusion in the future over when the loan agreement was interested into. List the full legal name and the mailing address of the borrower. Make sure that this person is identified as the borrower. If the note is secured, it is wise to also include the physical address of the lender. This can be beneficial if the lender needs to retrieve the collateral. List the full legal name and mailing address of the lender. This should include the city, state, and zip code. 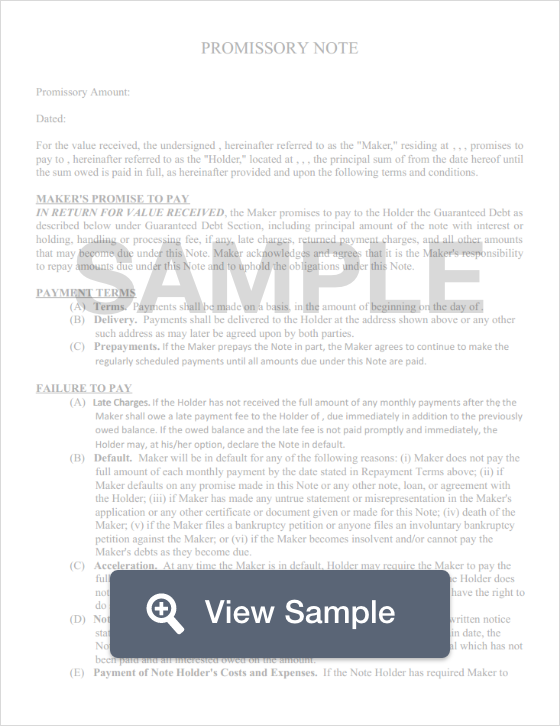 If the payment address is different, the payment address should also be included in the promissory note. The principal amount of the loan. This documents the amount that loaned. It also shows the difference between the amount of the loan and the annual interest rate that will accrue. Double check that this amount is accurate. The annual percentage rate charged for the loan. For promissory notes in Arizona, this can be no greater than 10% per year. If a lender charges more than this statutorily capped amount, they may subject themselves to serious legal problems. An explanation regarding how payments should be made. Most of the time, promissory notes are paid in installments. These installments are usually weekly, biweekly, or monthly. The amount of the payment should be documented. If there is a late fee that will be charged, it should be noted here as well. When creating a secured Arizona promissory note, remember to include information about the collateral that will act as security. It’s important to give enough detail to enable the lender to retrieve the collateral if necessary. If the promissory note doesn’t include the title that shows it is secured and if it doesn’t include a description of the collateral, it may not be considered secured if the borrower defaults. Interest Due in the Event of Default. This clause documents the amount of interest that will be charged if the borrower defaults on the loan. Payment Allocation. The purpose of this clause is to explain how a payment will be split between the principal balance and the interest. Prepayment. Sometimes, borrowers want to pay off the loan faster than expected. However, some lenders charge a penalty for doing so. This clause explains what happens prepayment occurs. Acceleration. An acceleration clause give the lender the right to demand the full balance of the loan if the borrower does not comply with the terms of the promissory note. Attorney Fees and Costs. The purpose of this clause is to explain who will pay for attorney fees and court costs if a disagreement occurs over the promissory note. Some Arizona promissory notes state that each party will pay their own fees and costs. Others state that if the borrower is sued because of a default and if the lender is granted a judgment, the borrower would also be required to pay the lender’s attorney fees and costs. Waiver of Presentments. This clause explains to the borrower that they must make their payments even if the lender is not present at the time the payments are made. Severability. A severability clause is important because it essentially states that if any clause or any term of the promissory note is unenforceable, the rest of the agreement is still in effect. Conflicting Terms. This clause states that if the promissory note has any terms conflict with each other, an amendment will be drawn up in writing to clarify the conflicting issues. The amendment will govern the promissory note instead of the conflicting terms. Notice. A notice clause gives information about how (or if) notice will take place if the lender files a lawsuit to obtain a judgment against the borrower if they stop paying on the loan. Governing Law. This is an extremely important clause. It defines which state will govern the agreement. An Arizona promissory note needs to be signed and dated by the borrower. It is not required to have a witness sign, the lender sign, or a notary.